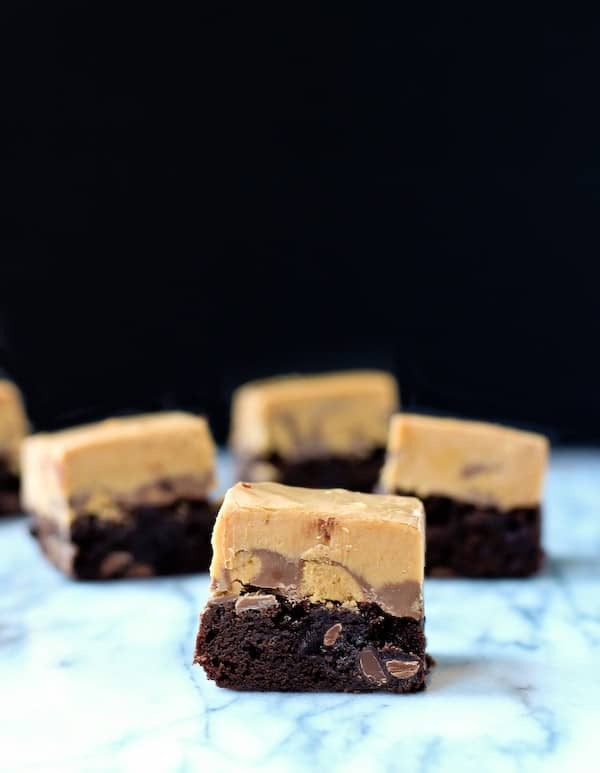 Rich brownies topped with peanut butter cups and easy peanut butter fudge – these 5 ingredient Peanut Butter Fudge Brownies are a decadent and easy treat. Do we have any peanut butter and chocolate fans in the house? Or should I say, do we have anyone that isn’t? I don’t even know what to say about this recipe – the photo speaks for itself, does it not? I’ll start by telling you where the recipe came from! 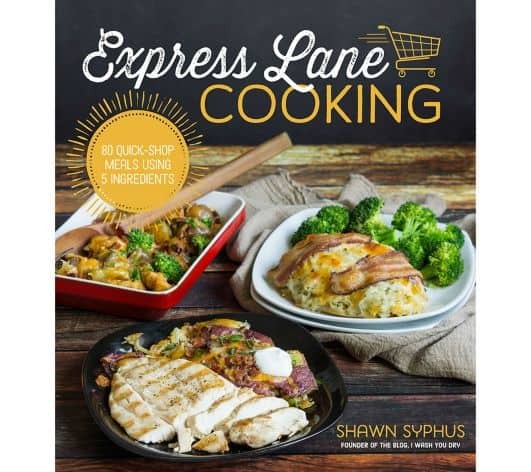 It’s from Shawn Syphus’ new book, Express Lane Cooking! Shawn is a blogging colleague – she writes the fabulous blog I Wash…You Dry. The concept behind this book is just genius. Shawn give you 80 recipes, all with photos, all made with 5 ingredients (plus pantry staples). But here’s the best part – you buy five ingredients from the store and you can make three different recipes with those five ingredients. Such a great way to reduce waste, shrink your grocery bill, and take the stress out of meal planning! Isn’t that such a smart concept? 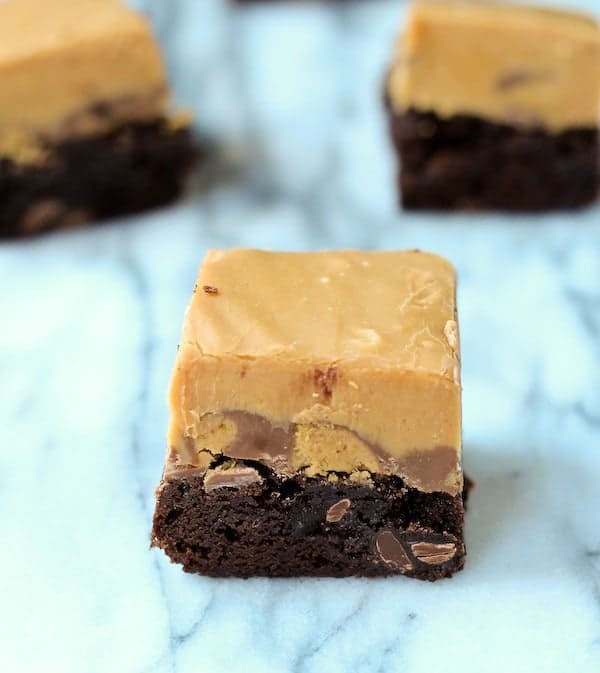 She also includes 5 dessert recipes – one of which gives you these rich peanut butter fudge brownies. They use a box mix brownie base. You could substitute with your fave homemade recipe, but as you know, I pledge allegiance to Ghirardelli brownies. So that’s what I used! Obviously. On top of the brownies, you add chopped peanut butter cups. 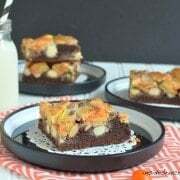 On top of that, a simple homemade fudge – made with only three ingredients: Peanut butter morsels, sweetened condensed milk, and vanilla extract. Simple and delicious – my favorite things, as you know. These are super sweet so they are definitely for those of you with a big sweet tooth. I shared most of these with me neighbors – they approved! Prepare your brownies according the package instructions in an 8″ x 8″ pan that has been lined with parchment paper. Leave them in the pan and let them cool completely. Top the brownies with the halved chocolate peanut butter cups, and then prepare the simple peanut butter fudge. Bring a small pot filled with 2 inches of water to a boil on the stovetop. Find a metal or glass bowl that can easily rest on top of the pot without touching the water. Add the peanut butter morsels, sweetened condensed milk and vanilla to the bowl. Stir the mixture over the boiling water until it becomes smooth. Pour the peanut butter fudge over the top of the brownies in an even layer. Let the fudge cool for at least 2 to 3 hours before slicing. Verdict: Love the concept of this book – and if this recipe is any indication, the recipes are winners! Can’t wait to cook my way through it. Difficulty: Easy! Make sure to give yourself plenty of time for each layer to cool. Craving more chocolate and peanut butter? 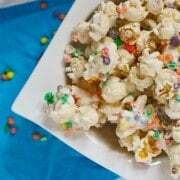 Try: Puppy Chow, Peanut Butter Cup Blondies, No Bake Peanut Butter Bars, Peanut Butter Chocolate Banana Milkshake, Peanut Butter Lover’s Trail Mix, 5 Ingredient Peanut Butter M&M Bars, or Peanut Butter Hot Fudge. Disclosure: I was sent a free copy of the book to review and cook from. I was not compensated in any other way. All opinions are my own. Sounds like a fun book! 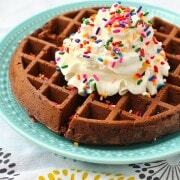 Super decadent recipe! You can’t go wrong with brownies and fudge. These look amazing! OMG I pledge allegiance to Ghiradelli brownies, too! I don’t think I knew that you were a fellow lover. =) I so rarely make homemade brownies these days, because that darn Ghiradelli mix is SO good. And these look fantastic! That chocolate/peanut butter is always one of my favorites. I love the concept of that book and 5 ingredients for 3 dishes. 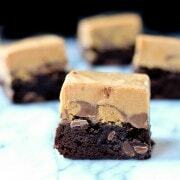 There are no words for those PB fudgey brownies! Shawn’s style of cooking is exactly what I need!! Pinning this recipe because it has everything I want in dessert: peanut butter and chocolate! You had me at “peanut butter and fudge” delicious! And I love the concept of saving on food waste – awesome! I kept thinking about you as I was writing this post!